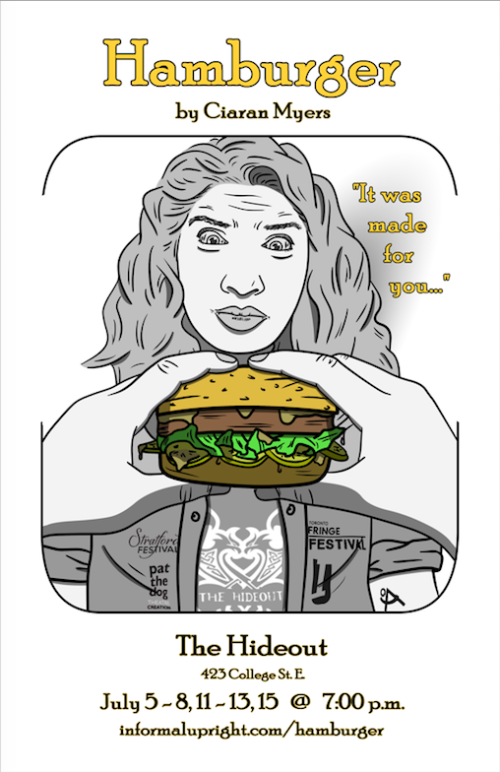 A commentary on workplace sexual politics, Hamburger started its life as a first draft created by Ciaran Myers at the Stratford Festival’s Playwrights Retreat. Now it is being produced by Informal Upright Theatre Collective and playing at The Hideout as part of the 2018 Toronto Fringe Festival. The Hideout felt like the perfect space for this piece. As the audience entered the venue, the two characters of the piece were already working in the bar. This gave audience members chance to live in the story with the characters Lib and Arie. We were also given the opportunity to purchase drinks from the bar and order off of a menu created specially to complement the show. We were also made aware that we could ask for drinks or food at any point in the show – don’t be afraid to do so! Once the show started, we got to know the two people working away in the bar more intimately. This narrative piece tracked the academically ambitious Lib and the opposingly stagnant Arie. As co-workers in a burger bar, we are let in on a seemingly insignificant relationship that proves to be much more meaningful than either of them could expect. Lib, played by Mina James, is a dynamic character. Throughout the piece, she expresses many highs and lows of her personality. Lib is flawed in many ways, and James’ ability to embody the variety of changes her character went through, along with the changing emotions and mental states throughout the show should be commended. Her acting was startling, in all the right ways, as it added depth to the script, and brought to life the very realistic situation Lib is facing. Arie is played by Zach Parsons, who only took over the role a day and a half ago. Despite this, he was grounded in his character, which made for a solid performance. , Parsons pulled off the character, and the show itself, flawlessly. While he performed with the script in hand, he was able to channel the character, and at times made me forget he was holding the script at all. In terms of staging, director Sukhpreet Sangha did a great job of using the whole space provided. The atmosphere felt realistic and was interesting from the audience’s point of view. While there seemed to be minimal staging, as there was minimal space, the contrast when characters moved towards and away from each other created a unique power dynamic, a running theme in the show. The one small critique I have for this piece was it’s sometimes confusing narrative. There were brilliant moments of intricate detail included in the script, but sometimes I found myself straining to catch up to a jump in time or a change in perspective. These moments made it difficult to trace the theme of sexual politics in the workplace throughout. With that being said, this show proved to be intimate, funny, and charming with a hint of sexual tension. Despite the team for Hamburger ‘calling an audible’ a day and a half before the show and bringing in Zach Parsons, Mina James was able to roll with the punches, making this a quirky show that is not be missed at the 2018 Toronto Fringe Festival.